Outdoor Carpets Tiles For the Modern Home. The purpose of outdoor carpets is to improve the area outside your house, such as walkways or the perimeter of garden areas. 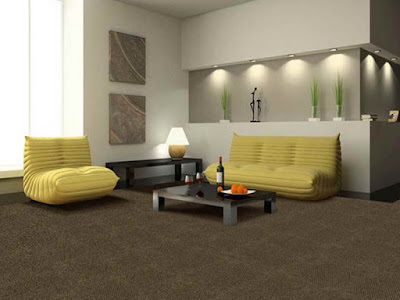 They are very different in construction than normal carpets, and are made to be tougher and more resilient. While there are both natural fiber and synthetic outdoor carpets, several kinds of plastic-based textiles are the most common materials. Synthetic outdoor carpets also tend to be cheaper than their natural counterparts, although some people prefer using grass mat - based carpeting. Besides adding the decorators' or owners' personal touch to the area, outdoor carpeting also has two very concrete advantages. First and foremost, wet carpeting (such as after a rain shower) is less dangerous and slippery than concrete. Second, the added layer makes the surface more comfortable and better isolated from cold coming from the ground, resulting in a more pleasant experience when sitting or walking with bare feet. It also merges the interior of the house with patios and conservatories in an appealing manner. Olefin and polyvinyl are common materials for artificial outdoor carpets, while sisal and reeds are usually employed as natural materials. An expensive alternative for outdoor carpeting can be heavy wool, treated to be waterproof so that it doesn't become damp and smelly. In nay case you will find that, provided the installation was carried out competently, you will not have any problems with dampness or odors as outdoor carpet specific materials are well waterproofed. There are several ways to install the carpet, the most common one being through the application of waterproof glue. Some carpets can be glued directly to concrete and others require some from of padding in between. Often, outdoor carpets can be bought in tiles, which makes installation easier, especially for DIY enthusiasts. Outdoor carpets are available in a wide range of patterns and colors, and you will surely find something that suits your eye. These are great materials to furnish the outside of your house, and they are also cheap and durable.